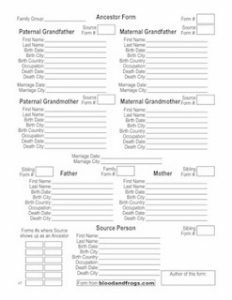 I’ve been using the same genealogy program for about twenty years (Reunion), but that doesn’t mean I don’t look at what else is available. I’m always looking at what other genealogy programs are available for the Mac, and although I haven’t switched, I am open to it if I found a program that really fit my needs better. 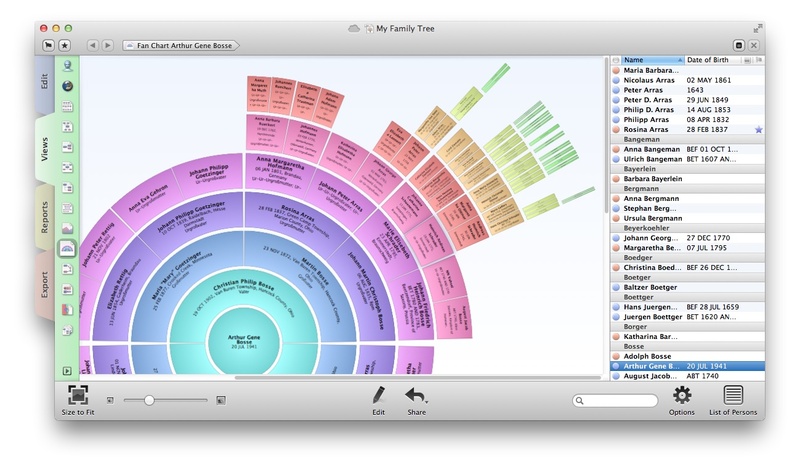 I’ve written in the past about genealogy programs available through the Mac App Store (and others that are not), so I’ve mentioned MacFamilyTree before. Yesterday MacFamilyTree received a major update, to version 7, so I thought it was worth mentioning again. It’s also worth mentioning because they are offering upgrade pricing ($29.95 instead of $59.99) to everyone who buys it in the Mac App Store through July 31. It’s a strange quirk of the Mac App Store that in essence companies cannot really offer upgrade pricing to their existing users. When you buy an application from the App Store, you own it forever. To get around this problem, some software companies release a new version of their program on the App Store as a separate program, and then reduce the price for everyone for a limited time. In this case, Synium Software, the makers of MacFamilyTree, are allowing anyone to get the upgrade pricing for the first two months, which I think is quite generous (sometimes companies only offer the upgrade pricing for a week). 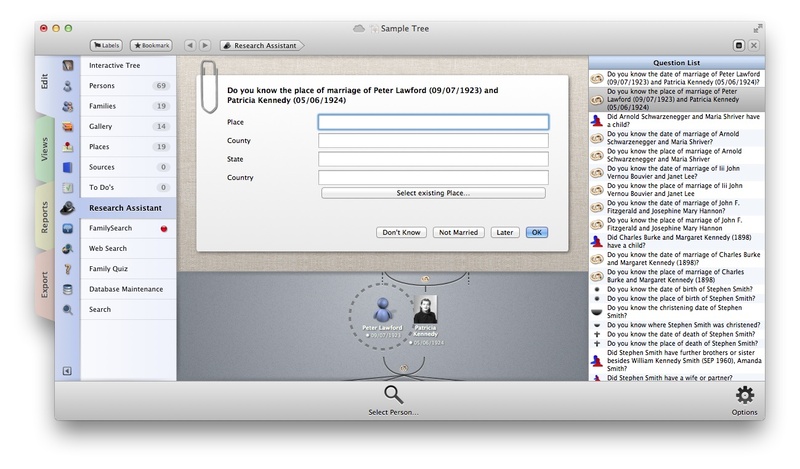 There are a lots of nice features of MacFamilyTree. In the past, my biggest problem in switching programs was the handling of images. Reunion has a very nice feature that allows you have one image, and cut out the faces of multiple people for use in your family tree. For example, if you have a family portrait with ten family members in it, and it is the only photo you have for all the people, you can select out the faces from the one photo for each family member. This might not seem like a major feature, but when you use it extensively to attach photos of people to their records, it’s hard to switch to a program that doesn’t offer that (and doesn’t import the cropped images I’ve already set up). I don’t know if MacFamilyTree 7 has a similar feature or not, but that’s one of the things I will be taking a look at when I look at the software. When I find the time to take a look in depth at MacFamilyTree 7, I will try to post a review here. If I do end up switching, I’ll try to explain how I moved everything over. 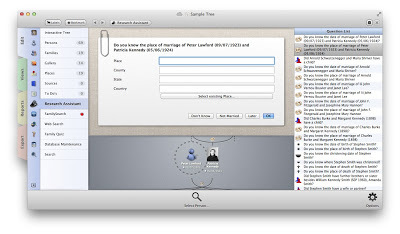 I should just add that I’m very happy that there are now several good options for genealogy software for the Mac. Besides Reunion and MacFamilyTree (Mac App Store), there’s Heredis (which is 35% off through June 9 – $38.99 instead of $59.99 – on their site and in the Mac App Store) and GEDitCOM II (software which has some very unique features that I like, but needs a major overhaul to make it competitive with these others). 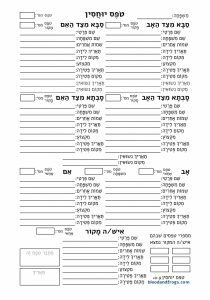 One of the nice features of most of these programs (not GEDitCOM II) is the availability of a companion app that runs on the iPhone and/or iPad. 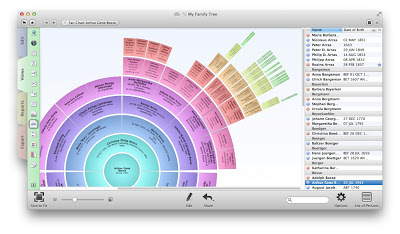 Reunion has separate apps for iPhone/iPod Touch ($14.99) and iPad ($14.99), MacFamilyTree offers MobileFamilyTree which can run independently of MacFamilyTree (normally $15.99 – now also 50% off through July 31 at $7.99), but can also share data with it, and Heredis offers Heredis for iOS (which is free). Also of note is that MyHeritage, which offers their free Family Tree Builder software for Windows (a $75 Premium version is also available), has said that the next version (Version 8) will be available on the Mac. It will be interesting to see how that software compares with these other programs. I hope they will offer the app through the Mac App Store, and offer the premium features and subscriptions through in-app purchasing. Update: Synium Software responded via Twitter that they do support cropping multiple images out of a single photo, as well as importing and exporting that information. Always happy to see companies that respond quickly and directly to customers.